There's definitely a buzz about it....I think it's supposed to open sometime in October. I hope it's not as crazy as when Popeye's first opened up here about 10 years; people were waiting in line 2-3 hours throughout the day on the day they opened. Five Guys did previously have an Iowa location, in Sioux City, about 4 hours northwest of here. No clue why they would have chosen "Sewer City" over Des Moines when the Des Moines metro is 4-5 times as large and rapidly growing, while Sioux City is declining. They had originally planned to open in Des Moines about 3 years ago....even had a location and they were hiring managers. I think that fell through when they realized what a poor location they had chosen (very high traffic intersection with poor lot access, and the building would have been virtually invisible to passing traffic). Because of that previous experience, I'm not going to fully believe it until signs are up. I knew before even checking the map that they'd chosen the Jordan Creek/Suburban Hell area. Jordan Creek/suburban hell??? Sounds like you've spent some time in this area. Just the 2.5 mile stretch of Mills Parkway from I-35 to Jordan Creek Parkway probably takes in more $$$ than the rest of West Des Moines combined. And West Des Moines retail was already taking in a lot of money even before this area was built. As a property tax payer, I don't mind. Rumor is that 2-3 more locations are already being discussed. My guess would be Ankeny and possibly even Altoona or Waukee before any get built in the city itself. 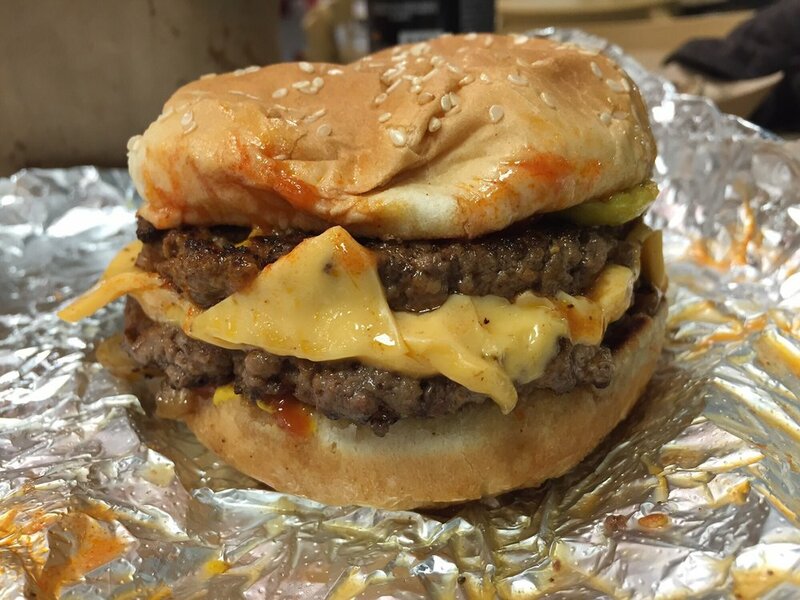 I've been going to Five Guys since they first opened in Northern VA. I used to live about a mile from the original location. Coincidentally, I now work about a block from the original location which is now a "payday lending" shop..
My take on their product is that I love the burgers. Despite comments to the contrary in this thread, I've found the quality of the food to be generally consistent from one location to another, at least in VA. On the other hand I don't care very much for the fries. They give you a huge portion, dumped into the bag, but they are greasy, and become limp before you can eat more than a few. I don't eat at Five Guys as much these days since the local (Herndon VA) store closed, but get in the mood for one every couple of months or so. There are two in the San Antonio area I know of. One is right across from the Alamo Quarry MarketPlace in Alamo Heights(a very old ritzy suburb) and in the Forum at Olympia Hills out my way. The Forum straddles two towns.Live Oak and Selma. Never been to the Quarry Market one, but have been to the Forum one. I like to sit outside ,because mainly the music is loud.It is believe it or not quieter sitting on the patio with the traffic from Agora Parkway than inside the place. Never had a problem with the food or fries.Service is fairly quick.This one is not a large place inside,but it is clean and doesn't smell or anything. Their fries are like the ones at Chester's Burgers, a local San Antonio chain. When I go to Chester's on Pat Booker in Universal City, I usually get a cheese burger and fries, with the burger being on a poppy seed bun. And I can watch sports on their big screen tv. Not that i'm a big sports fan, but that's what they have on. I do like their burgers, but I'm one of probably a small minority for whom a milk shake or malt is an important part pf going to a burger joint (even more so than fries, which I'll sometimes skip to make sure I have room for a big shake) and I've always shied away from Five Guys in favor of places that sell shakes (or even sundaes in the case of places like Culver's or Freddy's). Having said that, if I were in a remote area and all they had available to eat were a Five Guys and a few of the mass fast-food chains, I'd probably go for the Five Guys. Then Mooyah's is for you. As their one "differentiation" from Five Guys they have served shakes from the git-go. But realize that they were founded as a DIRECT RIP-OFF of Five Guys. Look here for a location near you. For myself, I do not patronize thieves. Five Guys here serves Malts now. They're complete!! Food aside, I cannot help but applaud Jerry Murrell - a simple, honest, decent man with a very simple idea - for his success as a an entrepreneur. As one of his original customers in Arlington, VA I was so very glad to see happy Brits swarming over his store @ St. Pancras-King's Cross, London. No, he's not Andrew Carnegie, but he - like Carnegie - is greatly unappreciated for the role he plays in creating "wealth". Absent such men, the "intelligencia" would have nothing to "redistribute". I believe our local 5 Guys now serves shakes but I couldn't attest to their quality as I've never had one. Thanks. If it's thievery, I'd probably follow your policy. Now that's interesting. I'll have to do some searching around here. I'm pleased to say the one around the corner from me is on the list. I'll be stopping in there soon, like possibly tomorrow. Also nice to see that many locations are getting the "Freestyle" coke machines. Hope the one near me gets that soon. I think the "freestyle" coke machine is right up there with sliced bread as one of the world's great inventions. Shoot. I think I was looking at the overall list of Five Guys and not the ones with milkshakes. It looks like none of the shops in the Philly area have them yet. I'll have to remain patient and will continue giving my business to the Freddy's near me in the meantime when I crave a fast-food style burger. Yep, except when the machine is out of your flavor I like that Coke has a Freestyle locator to make the machines easy to find. The one by work is participating. I will add Malted Milk one of the mix-ins. Probably won't add bacon. What's even nicer is that they have a smart phone app for finding them, too. While I don't eat at Five Guys, the ladies in my family do and when I stop in to get their order I usually pony up for a drink from the Freestyle machine. I really like the Fanta flavours they have. Just wish they'd add Pineapple. I stand by my point about the breadth of the menu, and BurgerFi's burgers are definitely assembled with more thought, but after stopping by Five Guys last night for the first time since I moved here five years ago, I have to admit... what they do have is pretty good. I'll never understand why they have to wrap in foil & get the bun steaming into a mess. I've being telling them that for thirty years. Their response is that they do so to keep the burger hot. Their first two stores were take-out only, so that's how "it" started. However, if you take a plate (paper or china) and tell the order-taker to have your burger placed on it, they will cheerfully accommodate you. And, the burger will look as good as it tastes! Paper plates,even the cheapest generic ones would be an improvement...and really wouldn't add much overhead. It'd be a good investment for an improved product!! Five Guys would have to change a lot for me to ever go there again. I see it as overcooked, soggy burgers, and fries in a greasy bag...............no thanks! To each is own. I find the fries the best around...plenty of them and fried in peanut oil. OIur burgers, if eaten quickly are hot and juicy...and all the free toppings give you wide variety. Tastier than burgers from sit down fast food like Applebee's and TGIF and such...and cheaper! !.....oh, and I eat plenty of those free peanuts! I would think they would serve it how you ask. That would make them almost perfect! !